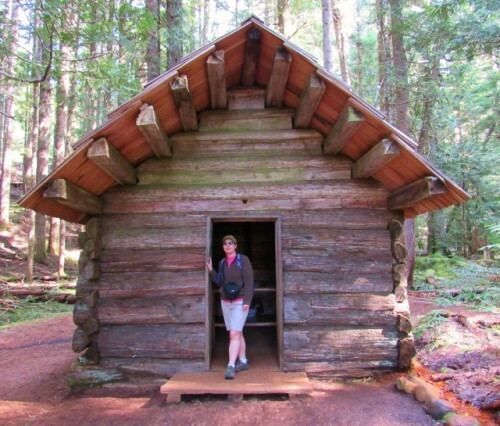 One thing that isn’t in short supply at Mount Rainier National Park is beautiful hikes! And we were able to experience a fantastic day of hiking! 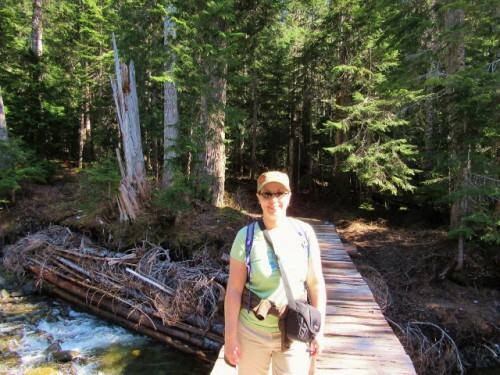 Our Sunday at Mount Rainier National Park was spent on a couple of hikes – one short and easy, and one long and hard. We first hiked the Trail of the Shadows, a short, flat hike right across the street from the National Park Inn. We saw old growth forest, the mineral springs that James Longmire spent his time marketing to tourists, and a few of the 100 year old structures built around the springs, now in ruins. The Mineral Springs don’t look like much now, but they are still bubbling! The springs at some points just bubble from the ground – it is fascinating to see! We also saw Elcaine Longmire’s (James Longmire’s son) cabin near the springs, built in 1888. It was neat to see how small and dark it was – I can’t imagine living in such a small, dark place all winter long! Then we began the Rampart Ridge Trail. It begins with several switchbacks that take you up high onto a ridge – the elevation gain is about 1300’. The hiking on the switchbacks is still pretty steep at times; I definitely had to stop and rest several times on the way up. While hiking this section, which was about 1.6 miles, we were treated to beautiful and peaceful old growth forest. Once we got to the top, we were greeted with a neat bird’s eye view of the Longmire Historic District and the National Park Inn! The hike then led us for a while along the top of the ridge. We got a fantastic view of the mountain at one point, and then began heading back down to the valley floor. We didn’t see any bears (maybe that’s a good thing, but it would have been awesome to see one at a safe distance! ), but we did see deer. And we heard the alarm call of a marmot, but sadly didn’t see him. The entire hike is 4.6, 4.9, or 5.0 miles, depending on which combination of signs and park materials you believe – I’m going with 5.0! We figure with adding the Trail of the Shadow spur we were probably close to 6 miles. Once we got back to the National Park Inn, we were more than ready for a late lunch. 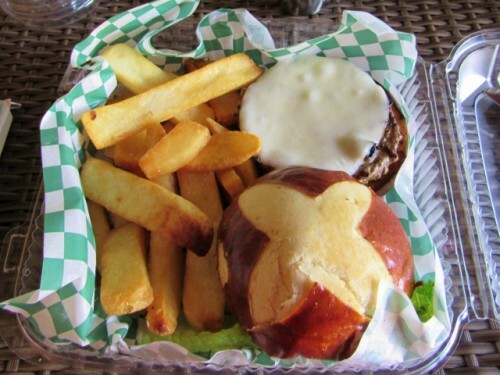 We both had grass fed burgers with pretzel buns on the front porch of the Inn; and we split a soda and a beer. The beef just melted in our mouths, and the buns were to die for! We relaxed in the chairs on the front porch, enjoying the fantastic view of this amazing mountain before resigning ourselves to the long, drive home. We loved our weekend trip, and have warm memories of our first visit to Mount Rainier! 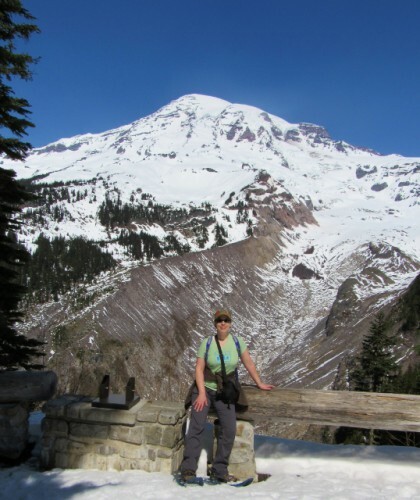 Have you hiked Trail of the Shadows or Rampart Ridge at Mount Rainier? What was your favorite part? I finally got the opportunity to stay inside a National Park! And I didn’t even have to camp! 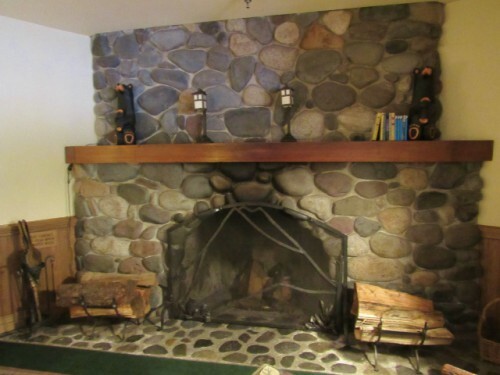 We stayed at the National Park Inn, which has a long and storied history. James Longmire (for whom the Longmire Historic District is named) was one of the first white settlers to visit the region and establish a business presence. Longmire homesteaded in Ashford, the closest town outside the park, and began building roads and trails into the area. He transported tourists to the park via a wagon road to bathe in the Longmire District’s mineral waters. 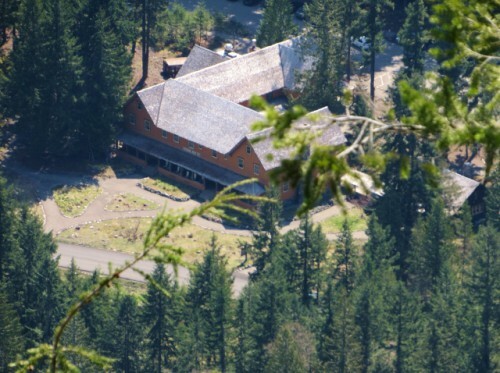 Over the next several years, he built a small hotel and expanded the trails in the area up toward Paradise. 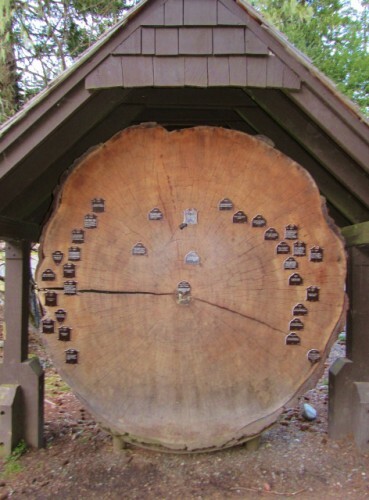 A cedar stump showing what was happening at specific points in history. 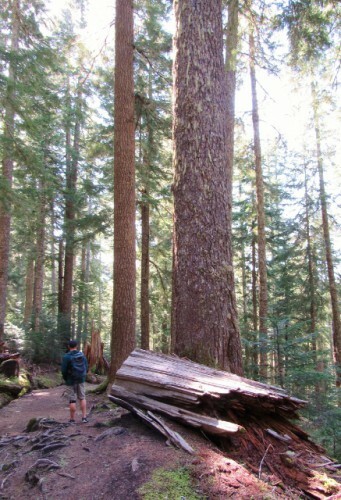 This tree was alive when Lewis and Clark visited the Pacific Northwest. 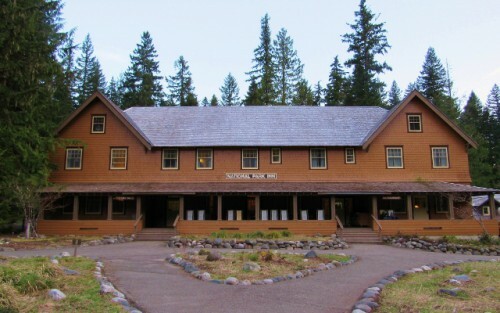 In 1906, the Tacoma and Eastern Railroad built the original National Park Inn, across the street from Longmire’s 30 rooms of assorted tents, cabins and hotel rooms. Longmire had died by this time, but his family was operating the business, and were irritated by this, and it soured Longmire’s relationship with the park’s administration. In 1916, the family leased their property to the Longmire Springs Hotel Company, who built another hotel and additional cabins. 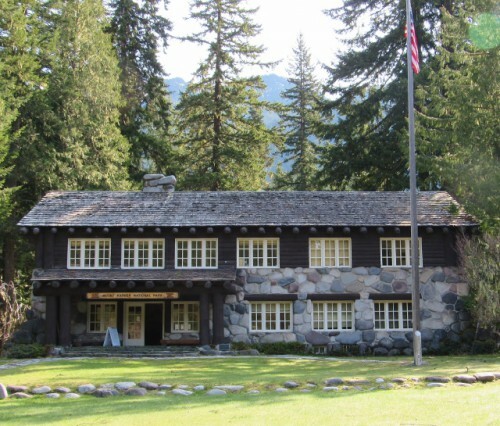 A few years later in 1919, park administration achieved a long time goal of having only one concessionaire, and a deal was reached that transferred all the buildings to the Rainier National Park Company, who operated the 1906 National Park Inn. The 1916 hotel building was moved across the street and became the National Park Inn Annex – this building contained 17 guest rooms. The 1890 hotel, and all the tents and cabins that the Longmires had built were demolished, to improve the appearance of the area. In 1926, the original National Park Inn burned down, leaving only the Annex, which is the current National Park Inn! What stories this old building must have! The Service Station, built 1929. We checked in and made a reservation for dinner about 30 minutes later – enough time to change our clothes and refresh a bit. The restaurant in the Inn can be described as fine dining in a casual atmosphere; we were dressed in jeans and hiking shoes and didn’t feel out of place – perfect for a National Park! Jon ordered the Rainbow Trout with a Deschutes IPA. I had the Pork Loin with tea to hydrate. 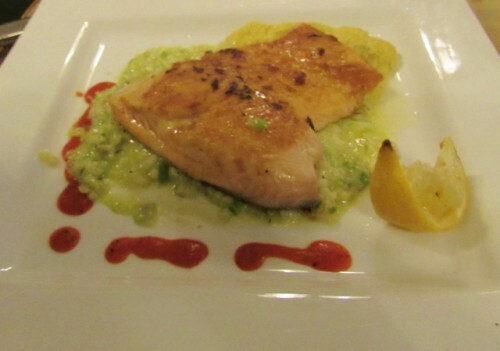 Both of our meals were delicious and the service was excellent; the only disappointment was the price of Jon’s beer. $7.75 for a 12 oz. bottle! That’s sports stadium pricing! I decided to wait for my wine until we went back to the room; we had brought a bottle with us. Our room was simple, neat and clean but small, and the bathroom harkened back to yesteryear. 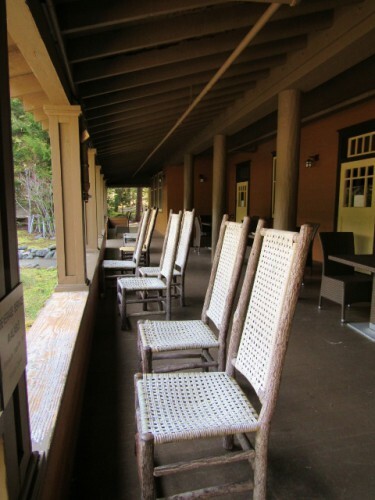 There are no TVs at the National Park Inn, no cell service, no phones in the room and no Wi-Fi. Forced interaction! Jon and I went with the flow and played National Parks Monopoly until we got too tired and declared a draw. What a fantastic day! The next morning, we woke up and went down to breakfast – our hotel stay included a voucher for their made-to-order breakfast – it was delicious! 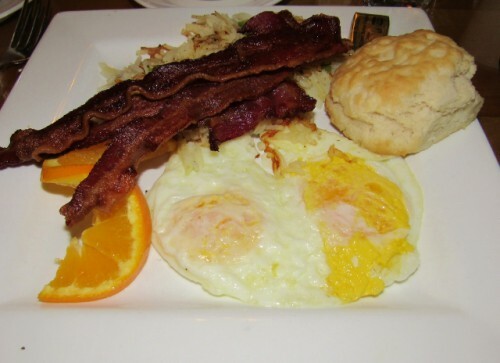 I had the Country Breakfast with eggs over medium, bacon and a homemade biscuit with tea, and Jon had the Veggie Omelet with an English muffin and coffee. Then we showered, packed our things, checked out and got out for a hike! Mount Rainier 2015: Waterfall Hike! 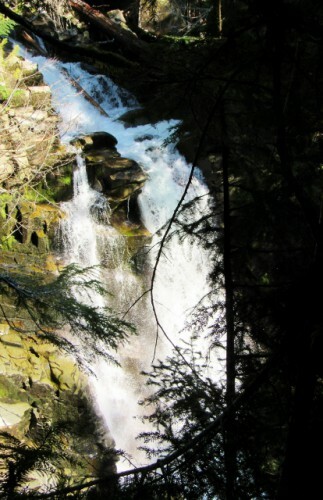 How often do you have an opportunity to see three waterfalls on a relatively short hike? We did at Mount Rainier! After our snowshoeing adventure, we drove back down the mountain to the viewpoint for Narada Falls. 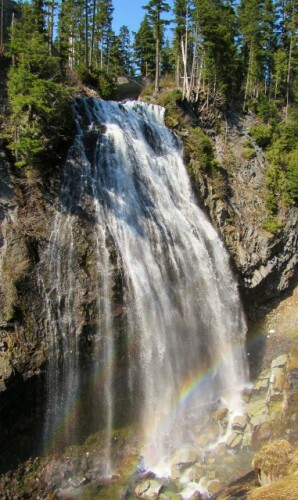 From talking with the ranger, we knew that Narada Falls had a trail that extends past the falls and follows a section of the Wonderland Trail. 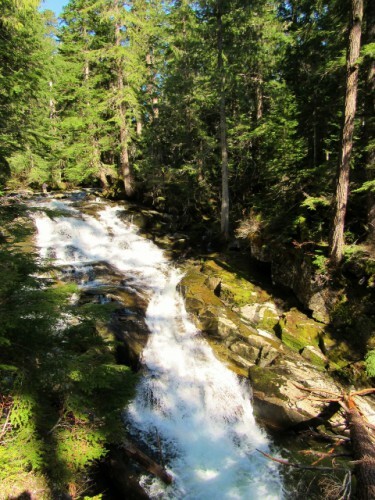 The trail also goes past two other waterfalls – Map Cap Falls and Carter Falls. We checked out Narada Falls, which is absolutely stunning. If you are visiting, you can see it from the parking lot, but to get the really good view, you really need to walk 0.1 miles down the paved trail to see it from below. You won’t regret it! 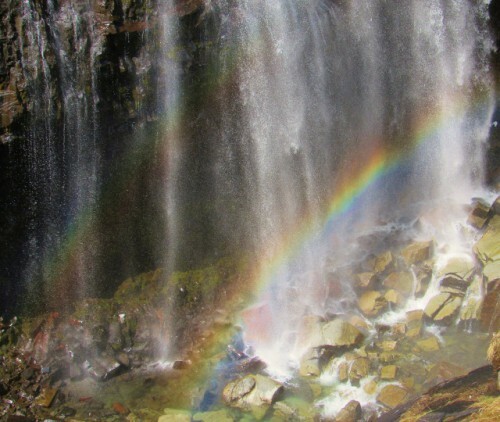 The sun was shining on the base of the falls, and we saw a beautiful double rainbow in the mist at the bottom. We made our way down the trail, and as usual, within a few hundred feet, all the other people melted away. We found ourselves totally alone. We had to do a bit of scrambling early on though, as there was a large tree down on the trail that we had to climb over. We found ourselves hiking downhill (which Jon hates because it is hard on his knees), always near the Paradise River, making our way through amazing old growth forest. Being early in the spring for this mountain environment, there was lots of evidence of the winter remaining – leaning trees, broken limbs, patches of snow and mud, but nothing compared to a typical winter here. I would guess that we hiked about 2 miles to reach Map Cap and Carter Falls. Carter Falls is a traditional waterfall, with a high plunging fall, but Mad Cap Falls is more like a series of rapids, a water slide waterfall! I would be curious to know if any brave souls have tried to careen down Mad Cap Falls in a raft! Mad Cap Falls – would you go down these in a raft? Due to a miscommunication on my part, this hike ended up being about twice as long as I was expecting – I thought the Ranger had said it was 1.1 miles each way from Narada Falls to Carter Falls, but he must have been talking about something else… Oops! The hike back was beautiful as well, but we were both getting really hungry and tired. And the trip back was all uphill! By the time we got back, I figure we had hiked 7.5 miles for the day – 3.5 miles of it over snow! All in all Narada Falls to Carter Falls was a great hike. Although it didn’t have mountain views, there was a peaceful serenity provided by the old growth trees, the sounds of the river, and the scenic beauty of three different waterfalls. Not to mention the fact that we only saw about a half dozen other people on the whole hike! We made it back to the car about 5:30, tired but really happy with our hikes for the day. It was time to make our way back down the mountain to the National Park Inn – our home for the night! 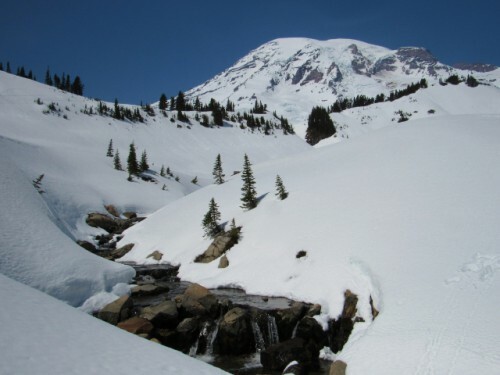 Did you know that Mount Rainier is one of the snowiest places on earth? Jon and I visited in April – a new National Park for both of us! At the beginning of National Parks week, when the parks have their fee-free day, Jon and I decided to make a weekend trip down to Mount Rainier National Park. We didn’t plan for our trip to coincide with fee-free day, as we have a National Parks pass, but it just happened to be Jon’s weekend off and we wanted to make the most of it. We got up really early – 5:15 am, and were on the road at 6:30. Driving was easy and we reached the park just after 10 am. View of Mount Rainier – a cloudless sky! We went in the southwest entrance of the park and passed by the National Park Inn in the Longmire Historic District – that’s where we would be staying the night. We decided to first go to the Paradise section – so we made our way up the Paradise Road. 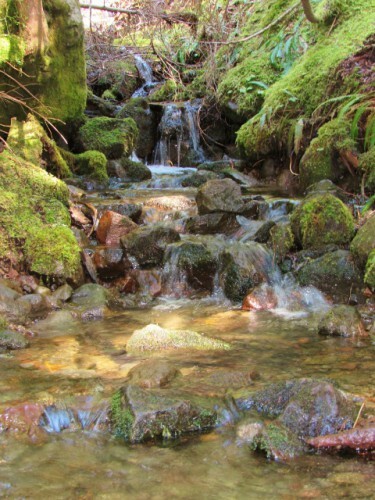 It is a really gorgeous drive, past bridges and waterfalls and old-growth forest. We parked at Paradise and went to the Visitor’s Center to figure out what we wanted to do. There was still a covering of snow on the trails, so we decided to rent snowshoes! 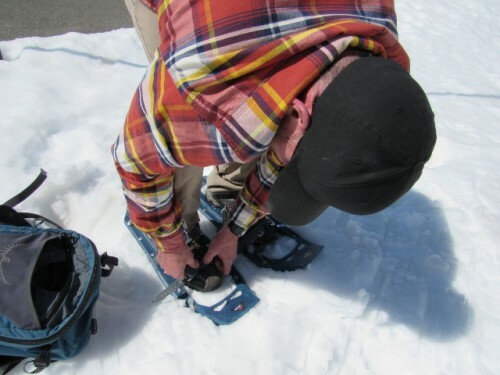 For $14.50 per person, you can rent snowshoes for the day – they aren’t particular pretty, made of blue plastic and rubber straps, but they do the trick. Jon straps on his snowshoes. We talked to the ranger about a couple of snowshoe trail options and headed out. The snowshoes took a little getting used to; you have to walk with your feet farther apart than you normally would and of course, you have to pick up your feet higher, as you are walking on snow. All in all though, they were easy to use and we found walking in the snow was much easier for us than others without snowshoes. Me as we set out for our first hike on snowshoes! The first trail we did (about a mile round trip) was the Nisqually Vista Trail. In the summer, this is a 1.2 mile paved trail; half of it was closed when we were there, so it was a slightly shorter out and back hike. The trail took us over a little bridge, along a small creek that was visible through the snow and out along a section of trail that had amazing views of the mountain and the Nisqually Glacier. We also had a view of the Nisqually River Valley. We loved the scenery! After we finished the Nisqually Vista Trail trail, we decided we still wanted to do more snowshoeing. 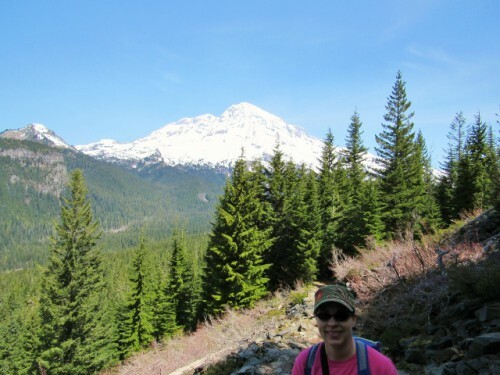 We decided to hike a bit out the Edith Creek Basin trail, which in the summer offers spectacular views of scenic meadows with wildflowers and crosses over one of Mount Rainier’s famous waterfalls, Myrtle Falls. The weather was beautiful, with lots of sunshine and temperatures in the 60s! It was crazy for April in Washington State! We went about a mile out, crossing over the bridge over Myrtle Falls and heading a little higher up the mountain. Many snowshoers and cross country skiers go much further to Panorama Point, but we stopped and turned around for a couple of reasons. This late in the season, we would be heading into a section that has a high risk of avalanches. The spring weather with the melting snow makes the heavy, slushy snow that is well known for sliding down the mountain, and we didn’t want to be anywhere near it! After we made our way back to the Visitor’s Center, we decided 3 miles was enough snowshoeing for the day, because we wanted to do some hiking as well! We had a great time snowshoeing and would definitely do it again! Plus, I want to return and see Myrtle Falls and the wildflowers in summer! After snowshoeing, we headed back down to a lower elevation to hike and check out some waterfalls! 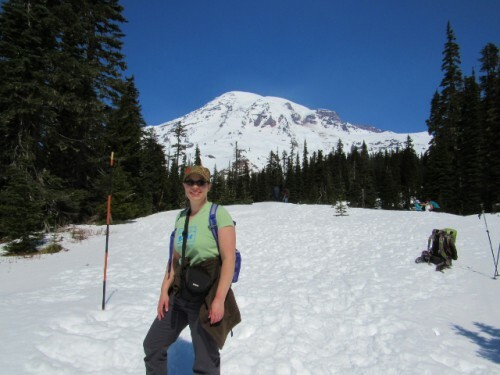 Have you been to Mount Rainier? Have you snowshoed at Paradise? Mount Rainier wasn’t the first National Park, but it was the first park created from an already established National Forest (then called National Forest Reserves). At the time, the Forest Reserves were intended to protect land under Gifford Pinchot’s philosophy of “conservation through use,” which conflicted with John Muir’s preservationist mindset. Lucky for us Washingtonians, we had Muir on our side. He had visited Mount Rainier in 1888 and felt re-invigorated by his trip; he rededicated himself to the cause of preserving nature through a series of National Parks. With support from the Sierra Club, the National Geographic Society, the Northern Pacific Railroad, and business leaders in Seattle and Tacoma, WA, the Pacific Forest Reserve (designated in 1893 and enlarged and renamed Mount Rainier Forest Reserve in 1897) was converted by Congress and President William McKinley to Mount Rainier National Park on March 2, 1899. It was this nation’s fifth National Park. Today the park encompasses 236,381 acres (369.35 square miles), and its main feature is the 14,410 foot stratovolcano Mount Rainier. 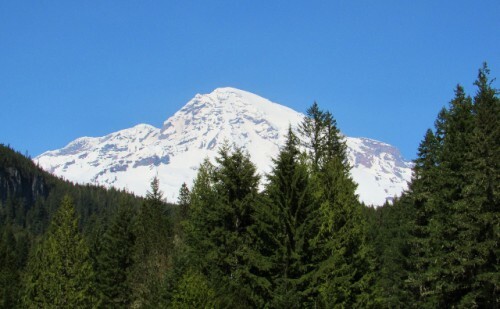 The mountain is the highest in the Cascade Range, and has valleys, waterfalls, sub-alpine meadows, old-growth forest and over 25 glaciers; Rainier has the highest number of glaciers in one place in the lower 48 states. Several Native American tribes have used the park for hunting and gathering for thousands of years, but there is no archaeological evidence of permanent habitation within the boundaries of the park. Artifacts found within the park include projectile points and hunting artifacts (the projectile point dates to 4,000-5,800 BP) and a rock shelter. 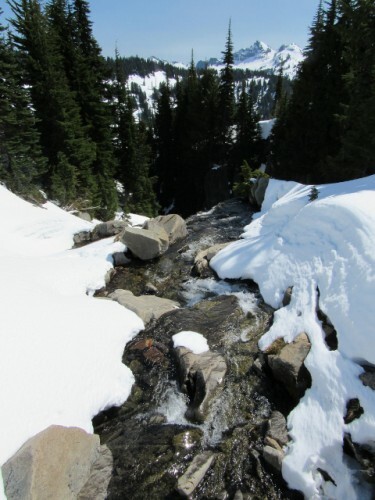 In its early days as a National Park, Mount Rainier was popular for its mineral springs in the Longmire District of the park. James Longmire was largely responsible for the first development in this section and the entire park is designated as a National Historic Landmark District today. Later on, hiking, skiing and snowshoeing became more popular with tourists, especially after the opening of the road to Paradise and the Paradise Lodge in 1916. 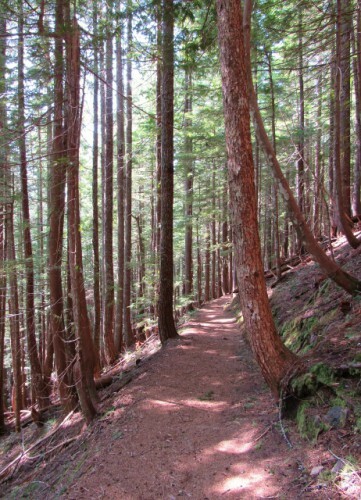 The Wonderland Trail draws many adventurers – it is a 93 mile hiking trail that circles the park. You can hike the whole thing, camping along the way, or choose a section for a day hike. 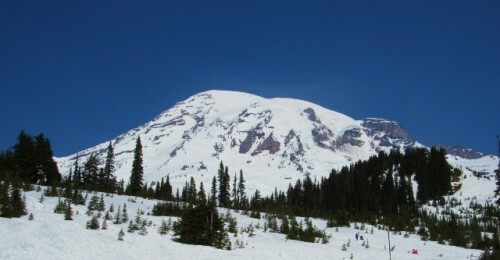 Mount Rainier is also popular with mountaineers, with over 10,000 summit attempts each year – about 50% are successful. Unfortunately, since Mount Rainier became a National Park in 1899, 116 people have died climbing the mountain. A total of 411 have died within the park boundaries; this total includes those who died climbing and those who were engaged in other recreational pursuits. Sadly, some of the people who are drawn to the wilderness don’t come for benevolent purposes. On January 1, 2012, Benjamin Colton Barnes murdered Park Ranger Margaret Anderson while trying to flee into the wilderness. Barnes had shot 4 people at a New Year’s Eve party in Renton, WA – two critically – before arriving at the park heavily armed. After a manhunt involving 200 law enforcement officers and a swift water rescue team, Barnes was found dead of drowning (hypothermia contributed) in Paradise Creek. I mention Ranger Anderson’s murder because it was so significant for us in the Pacific Northwest. It is the only time I know of when an entire National Park was closed and evacuated during a manhunt. It was huge news and a true tragedy when considering what our National Parks stand for. However, 1,038,229 people visited the park in 2011, so despite the dangers of mountain climbing or accidents, the mountain is still very safe for visitors. 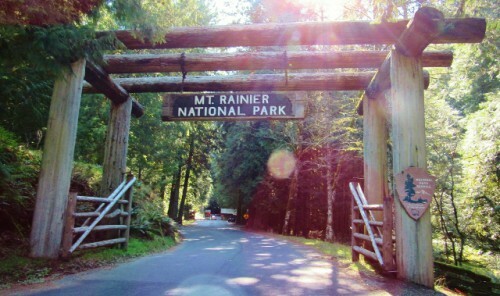 The entrance to Mount Rainier at Longmire – sparkling in the light of a gorgeous spring morning! Jon and I spent a spectacular sunny and warm weekend there in April, staying at the National Park Inn in the Longmire District. Despite growing up so close, neither of us had visited Mount Rainier before! I will tell you about our visit in my upcoming posts!